, an eminent English divine, was born Oct. 15, 1561, in the parish of Hempsted in the county of Hertford, of an ancient family of good repute in that county. The estate which came to him from his father and grandfather had been in the family many years before, and it is recorded as somewhat singular that out of his grandfather’s house, there had died but three owners of this estate in 160 years. 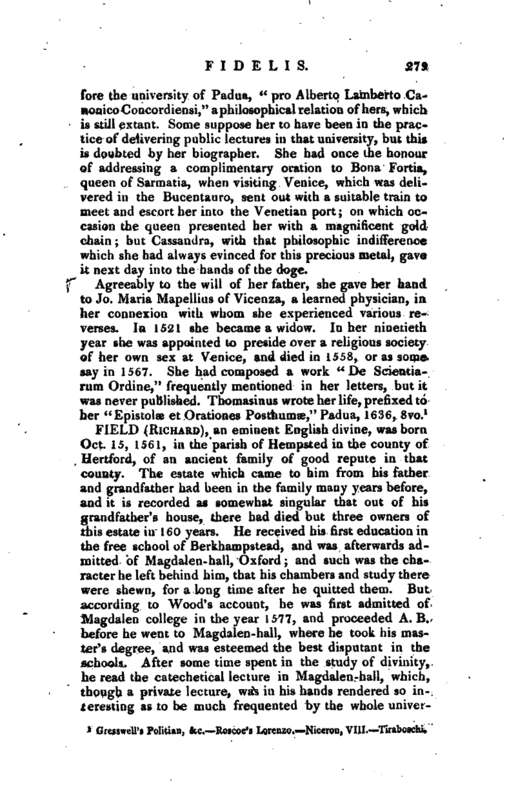 He received his first education in the free school of Berkhampstead, and was afterwards admitted of Magdalen-hall, Oxford; and such was the character he left behind him, that his chambers and study there were shewn, for a long time after he quitted them. But according to Wood’s account, he was first admitted of Magdalen college in the year 1577, and proceeded A. 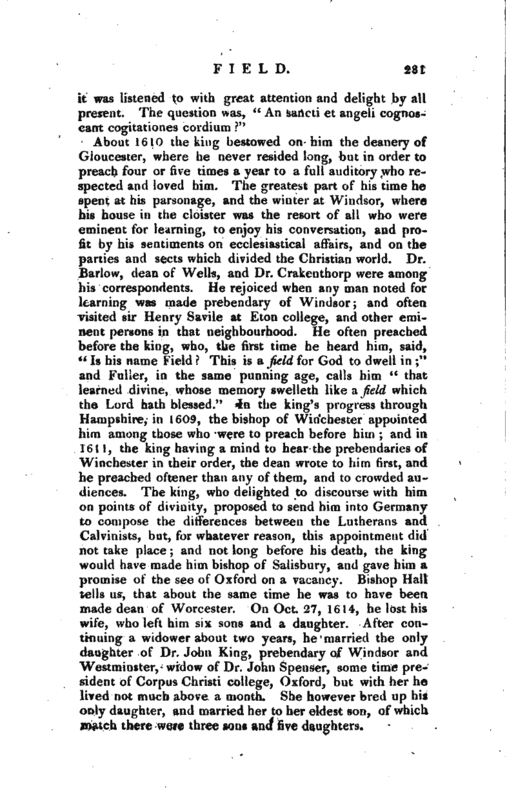 B. before he went to Magdalen-hall, where he took his master’s degree, and was esteemed the best disputant in the schools. After some time spent in the study of divinity, he read the catechetical lecture in Magdalen-hall, which, though a private lecture, was in his hands rendered so inieresting as to be much frequented by the whole | university. 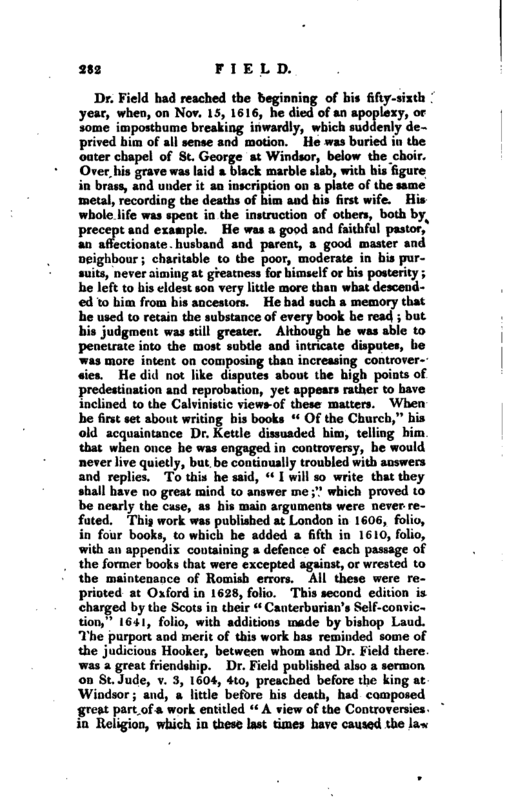 Dr. John Reynolds, though greatly his senior, and either then or soon after Margaret professor, and president of Corpus Christi college, was a constant auditor. 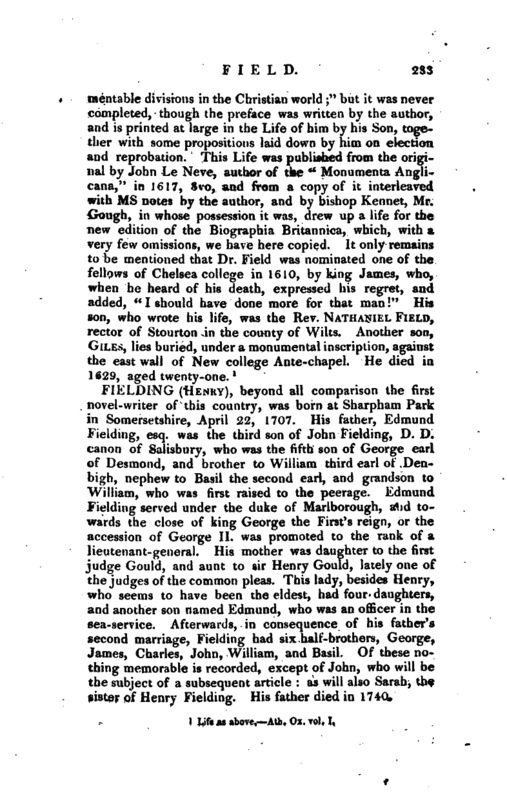 Field was well skilled in school divinity, and a frequent preacher while he lived in Oxfordshire, and is said to have been very instrumental in preventing the increase of nonconformity in the university. 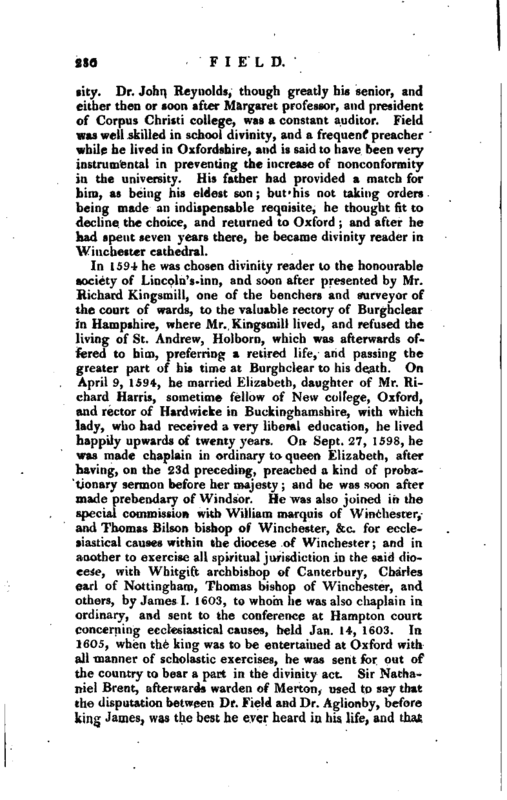 His father had provided a match for him, as being his eldest son; but his not taking orders being made an indispensable requisite, he thought fit to decline the choice, and returned to Oxford and after he had spent seven years there, he became divinity reader in Winchester cathedral. Life as above, —Ath, Ox. vol. I.